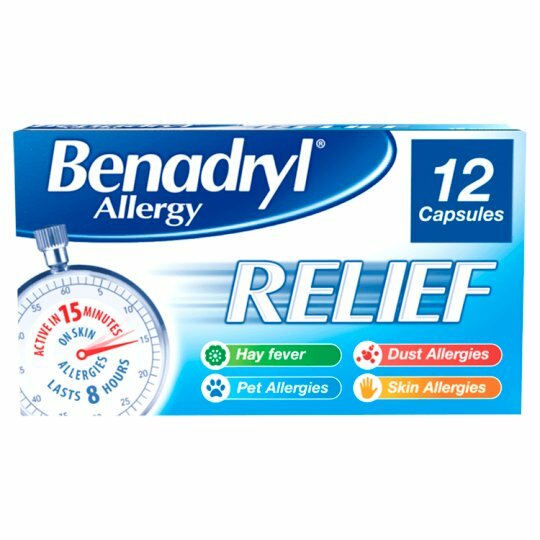 Benadryl Allergy Relief works to relieve the symptoms of hay fever and other allergic conditions such as pet, skin or dust allergies. Do not store above 30°C., Store in the original package. The enclosed leaflet has more information such as side effects. Benadryl Allergy Relief may cause drowsiness and dizziness. Therefore, caution should be used when driving or operating machinery. If this product makes you feel drowsy, or dizzy, do not drive or operate machinery. This product should not be taken whilst under the influence of alcohol. WARNING: DO NOT EXCEED STATED DOSE KEEP OUT OF THE REACH AND SIGHT OF CHILDREN. As with all medicines, if you are pregnant or breast-feeding, consult your doctor before taking this product. If symptoms persist, consult your doctor or pharmacist.